Rolling to 15-0 with a pair of wins last week and picking up a win against #4 Shelton State since the last NJCAA Top 25 poll, the Seward County Lady Saints climbed to #4 in this week’s poll, marking their first top five appearance since the final poll of the 2006-2007 regular season when they were ranked #2. Seward County jumps two spots this week, moving from #6 to #4 in the poll. Defending National Champions Gulf Coast remain in the top spot for the 11th straight week while 13-0 Odessa follows them at #2 and 16-0 Chipola checks in at #3. 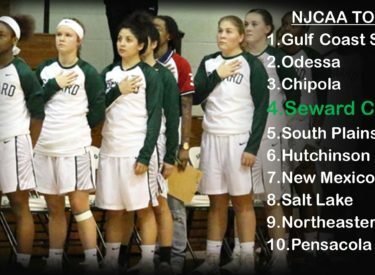 After the Lady Saints at #4, South Plains is the first one loss team recognized as they move into the top five as well at #5. Riding an 11 game win streak, Hutchinson is the #6 team this week and fellow Jayhawk Conference foe Cowley remains at #18. Former Lady Saints assistant Penny Jones and Pensacola crack the top 10 for the first time this season at #10 with their 16-1 start to the year. The Lady Saints 15-0 start is the best start since the 2006-2007 squad that eventually finished the year 36-2. Seward is out to an 11-0 start through the rugged 26 game Jayhawk Conference schedule to hold the top spot there, one game in front of Hutchinson, who the Lady Saints will take on next Wednesday in the Sports Arena. Seward will put their new ranking on the line tonight in the Greenhouse as they take on Dodge City at 6:00.